The Golden Gate Bridge links the urbanity of San Francisco with the wild headlands of Marin County, as if to suggest the paradox of California and America itself, the place that Fitzgerald saw as the last spot commensurate with the human capacity for wonder. The bridge, completed in 1937, also announced to the world America's engineering prowess and full assumption of its destined continental dominance. The Golden Gate is a counterpart to the Statue of Liberty, pronouncing American achievement in an unmistakable American fashion. The nation's very history is expressed in the bridge's art deco style and stark verticality. 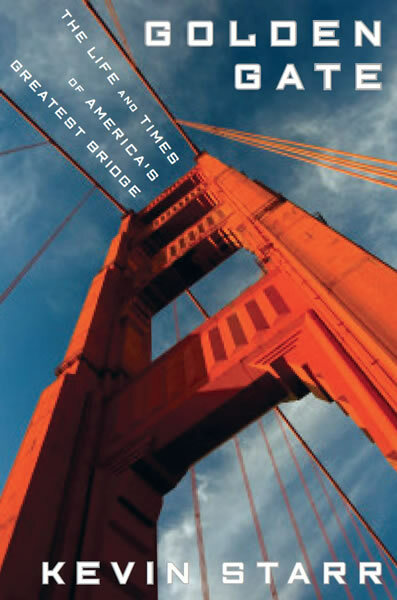 Kevin Starr's Golden Gate is a brilliant and passionate telling of the history of the bridge, and the rich and peculiar history of the California experience. The Golden Gate is a grand public work, a symbol and a very real bridge, a magnet for both postcard photographs and suicides. In this compact but comprehensive narrative, Starr unfolds the hidden-in-plain-sight meaning of the Golden Gate, putting it in its place among classic works of art. Starr eloquently retraces this industrial achievement from planning and construction up to the present day with its $6-and-up tolls. He tells the story behind each of the bridge's masterminds — the bankers, builders, egos and engineers — and also devotes a whole chapter to a tragic side of the bridge's history as a frequent site of Bay area suicides. Kevin Starr seems particularly well equipped to write a biography of that famous orange bridge. The author of more than half a dozen histories of California, Mr. Starr has written frequently about the myths and metaphors that festoon the Golden State, and he seems to instinctively understand the place that the Golden Gate Bridge has come to occupy in the national imagination as a symbol of American enterprise and the gateway to the Pacific. Mr. Starr does an agile job of situating the tale within the larger context of San Franciscos efforts to rebuild after the Great Earthquake of 1906 and the nations march from the Roaring Twenties into the slough of the Great Depression. A lively monograph about the planning, funding, construction, and aura surrounding the Bay Areas Golden Gate Bridge.